According to the obituary for Fred. In 1896, when Fred was aged just 16, he joined the 1st Volunteer Battalion York and Lancasters, Hallamshire Rifles. They were known as the Hallamshire Rifles to reflect the fact that the regimental district included the area West Riding of Yorkshire, which was known as Hallamshire. York and Lancaster does not depict the counties, but the Duchy of York and the Duchy of Lancaster of South Yorkshire. The colloquial name for the York and Lancasters was the Young and Lovelies. Their cap badge the Yorkshire rose and a tiger ensured they were also known as the Cat and Cabbage. By 19 years of age Fred had made Sergeant. Shortly after this promotion Fred served in the South African Wars, 1900 - 1902. During the 1901 census Fred was presumably in South Africa fighting for Queen and country. He served first in Natal at Laing's Nek then afterwards on Lord Kitchener's staff in Pretoria. Conditions must have been very difficult for the soldiers. The Boers fought as guerillas and disease was rife among soldiers with the British losing more men to typhoid than died in battle, (13,000 soldiers to typhoid compared to 8,000 in battle). 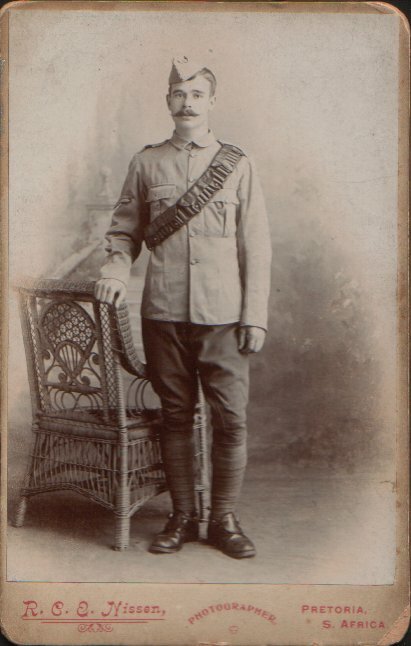 A young sergeant, Fred Bini, in his uniform including ammunition bandolier and spurs marking him out as a Mounted Infantryman. Fred was awarded the South Africa medal with three bars, Transvaal, Orange Free State and Cape Colony. The South Africa War was over by May 31st 1902 with the British victorious, though much criticised for their use of concentration camps for civilians. 26,000 women and children died of disease and starvation in 50 concentration camps. Fred returned to England for King Edward VII's coronation, due to take place June 26th 1902, but this was postponed as Edward had to undergo an emergency appendectomy operation. The coronation took place August 9th 1902. Fred went home to Sheffield. Fred married Florence Charlotte Bingham in 1904. Their first child, Florence Marjorie, was born in 1905 in the Ecclesall Bierlow district of Sheffield. In 1910 my own grandfather was born and named John Bingham Bini. As was common at the time the son was given the mother's maiden name as a middle name. My grandad was known as Jack. At this time the family are found at 16, Rushdale Road, Meersbrook, Sheffield, the small terraced house is still there and was recently for sale. The family can be found at the Rushdale Road address in the 1911 census. I have been excited to see my relatives' handwriting on all of the available 1911 censuses, but Fred's is beautiful, almost an art-form. I have printed numerous copies of 1911 census documents and Fred's writing is by far the neatest copperplate I have seen. I feel quite proud that his writing is so beautiful. In White's 1911 Trade Directory for Sheffield, Frederick Bini is listed as a Car Conductor. I believe a car conductor to be a tram conductor, collecting fares and issuing tickets. I believe at some point before World War 1, Fred moved his family to Shireoaks, near Worksop. They lived on Shireoaks Row. Shireoaks Row was known locally as Tub Row because, as there was no mains water until 1932, residents placed large tubs outside their homes to catch rain water. The row of cottages were built in the late 1850s by the Duke of Newcastle to house his mineworkers. There were 56 cottages and 2 shops. Originally there were open yards to the rear of the houses across which was a shared wash house and an earth closet. Behind this each miner had a pigsty and kept pigs, fed with food waste, to supplement their diet. I have no idea whether Fred and Florence kept a pig. I do know that their children had piano lessons, something, I imagine, was outside the norm for miners' children. Marjorie was quite an accomplished pianist. We are now approaching the start of World War I, The Great War, the war to end all wars. Fred rejoined the Fourth York and Lancaster Battalion, Hallamshire Rifles, at the beginning of the war, as a sergeant. A personal war diary by John Henry Edward Cook, transcribed by his granddaughter, has allowed me a glimpse in to the life of my own great grandfather at this terrible time. According to the diary, Fred's battalion left for France on 13th April 1915 and they arrived at Boulogne in the early hours of the morning. They rested and then moved out. Fred was a seasoned soldier having served in South Africa, but I wonder whether anything prepared him for this war. As the battalion moved closer to the front, the villages showed worse effects of shelling. Around the 26th April 1915, they came under heavy crossfire from the front and both sides. The diary's author states there were no casualties for several days. During early May the battalion has had days of rest and days where they relieve the 5th battalion of the York and Lancasters. The shellfire is often heavy with crossfire picking off soldiers. The weather is almost consistently dreadful, with heavy rain causing the trenches to fill with water creating the dreaded mud. Soldiers sometimes waded waist deep through the mud with little opportunity to get clean or dry. It is little wonder that parasites and infections, including trench foot, were rife. According to the diary, on Whit Monday, 25th May, the 4th York and Lancasters, Fred's battalion, are fetched from their rest to the reserve trenches. The diary describes a manoeuvre that, Mr Cook says, became known as “The Hallamshire's Steeplechase”. The diary claims that on Tuesday 26th May, the battalion, including my great grandfather, were told to charge across approximately 400 yards of open space under very heavy shellfire. They are told to, “show themselves to the enemy to draw fire”. Whilst some of the company perform this manoeuvre, other men counter moved by rushing the enemy trenches. The move was successful, but Fred is severely injured along with Lance Corporal Cunningham and Stretcher Bearer Sherlock. I can only imagine the fear these men, these sons, brothers and husbands, felt as they charged out across no-man's-land with the real possibility that the day would be their last. During Fred's recovery he was sent back out as the Regimental Sergeant-Major of a Labour Battalion. R.S.M. is the most senior soldier rank in the British Army, typically reached after 18 years of outstanding service. Warrant Officer Class 1, WO1, are the senior advisers of their unit's Commanding Officer, with leadership, discipline and welfare responsibilities of up to 650 officers and soldiers and their equipment. Fred had achieved this rank during active service. Fred served with the Labour Corps until Christmas 1918. The Labour Corps was manned by officers and other ranks who had been medically rated below the "A1" condition needed for front line service. Like Fred, many were returned to the Labour Corps wounded. The Corps was seen as secondary to the soldiers' original battalion, men who were killed during their service were commemorated under their original regiment. In the top photograph, Fred is a Sergeant, seated front left. He was in the 4th Battalion of the York and Lancasters. As they are all sergeants they are probably all from the same company in the battalion prior to leaving England for France. In the second photograph, Fred is at the back left. Seated is the Colour Sergeant Major. The others in the picture are also senior NCOs from Fred's company. The third photograph is again of the NCOs, this time Fred is seated, far right. You will note that the Colour Sergeant Major is now wearing the same tunic as the others pictured.